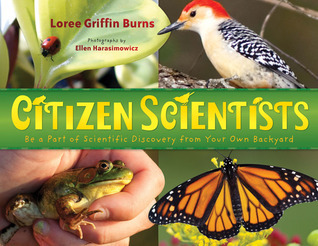 CITIZEN SCIENTISTS is out today! Full disclosure: The author of this book, Loree Griffin Burns, is my friend and critique partner, and she fed me lunch in the middle of my pouring-rain drive through New England last fall. That said, I’d be singing this book’s praises even if Loree were a stranger who didn’t make great soup. I love this title for so many reasons it’s tough to know where to start. There’s the gorgeous, outdoor photography by Ellen Harasimowicz…that perfect nonfiction voice that’s knowledgeable and fascinating but friendly, too… and opportunities for kids to get involve and extend the reading experience after the last page is turned. But really, what I think CITIZEN SCIENTISTS does best is take science out of the realm of “hard stuff that grown-ups do” and brings it to a kid’s level, not through the usual kitchen counter experiments but through getting young people involved in actual scientific research projects. CITIZEN SCIENTISTS explains in vivid and stunning detail how kids can count birds and listen for frogs, tag butterflies, record data, and make a real, substantial difference in the world of science. And it does all of that in a storytelling voice that brings kids into the adventure right away. Essential for readers who like to be outside (or kids you wish would leave the living room more often!) and for elementary and middle school classrooms & libraries, this is a beautiful book filled with gorgeous photographs, and loaded with resources to help kids get involved in real-life science in their own back yards. Thanks, Kate, for the heads up about Loree Griffin Burns’ new book. I loved her last one — The Hive Detectives: Chronicle of a Honey Bee Catastrophe.